We all love only fools and horses. 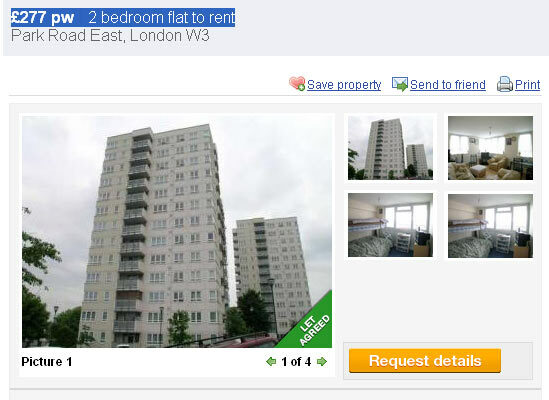 But how much would it cost to rent Del boys flat. Of course it worth mentioning that you wont find it in Peckham. According to the Only fools and horses Societies web site www.ofah.net Nelson Mandella House as seen for all the opening credits of Only Fools and Horses, supposedly in Peckham, London is actually the block of flats called Harlech Tower, Park Road, East Acton, London. £277 pw – 2 bedroom flat to rent ! Thats over £1200 a calendar month. Harlech Tower, Park Road, East Acton, London. Spacious, well presented two bedroom flat available now. Featuring two double bedrooms, a separate lounge with private balcony, a modern fitted kitchen with new cooker, fridge and washing machine and a family bathroom with separate toilet. Harlech Tower benefits from being recently refurbished: there are now security doors accessed by an entry phone system, new double-glazing and new lifts in the building. This flat is within easy walking distance to both Acton Town and South Acton stations and the amenities of the High Street. So if you want to live like Del boy it isn’t as cheap as it used to be!